If you are looking for a standard basic black leather checkbook cover, you'll find a selection of designs to choose from at Value Checks. Black checkbook covers where probably one of the first types of checkbook covers ever made. When you select your cover from this collection, you are choosing a simple and functional design. Luxurious leather covers will last a long time and can be ordered at low prices. 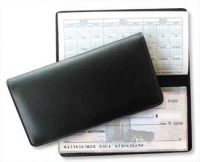 Find the perfect black cover for your personal checks. Value Checks checking account accessories are beautifully crafted and loaded with high-quality details. Most people prefer the look, feel and durability of a leather cover. 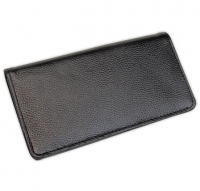 Leather black checkbook covers last a long time, come in a wide variety of designs and have cheap pricing. Your preferences may go towards the vinyl black checkbook covers because they are the cheapest type of personalized checkbook cover available. 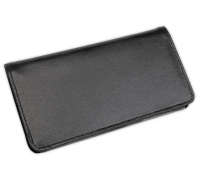 Our cheap black checkbook covers will protect your personal checks from getting exposed to the elements and the wear and tear they get from normal usage. 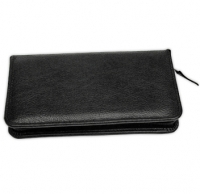 You'll find that Value Checks has a great selection of inexpensive leather, vinyl or cloth black checkbook covers. Each one provides you a place to put a check register so you can stay organized with your check writing and helps you live within your means. 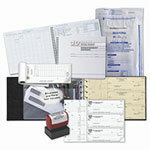 To order special checkbook registers, you can find a large selection in our Registers Category. Check registers come with a monthly calendar and a place to record your personal check writing. Thank you for shopping at Value Checks. We appreciate your business. Order your personal checks and matching black checkbook covers at discounted prices.